For yourself or as a memorable gift for someone you love, our handcrafted hardwood Jewelry Box is the perfect place to store your jewelry and keepsakes. 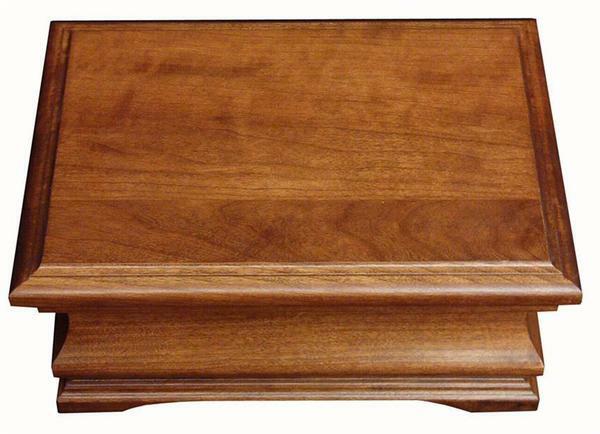 Crafted from your choice of Oak or Cherry, and finished in a premium stain and varnish, this heirloom quality jewelry box is made to last a lifetime and serve as a wonderful hand-me-down to be cherished and enjoyed for many generations to come. The classic style is reminiscent of a classic Colonial or Louis Philippe style, with a flat top edged with a beautiful design that sits on top of a elegantly curved case and base. The antique charm of this jewelry box is sure to make the perfect statement, no matter the decor. Inside felt lined compartments are ready to hold all of your valuables and keep them organized and ready whenever you need them. Shown with two classic stains, we can also customize this piece with your preferred stain. Please call one of our Furniture Specialists today to request a custom quote, ask us any questions about this piece, and place you order by phone. Toll-Free (866) 272-6773. 11.5" x 8.25" x 5"